Kate Clow is from outer space. I will forever be thankful for her tome uniting a ragged network of trails together, her dedication to the obsessive task of mapping and cataloguing the locations of cisterns, markets, and civilization in both its present day and ancient ruin forms, but she has a concept of time and distance unfamiliar to most earthlings. In Clow's universe, an 18-kilometer hike takes six pleasant hours and a grueling series of rocky switchbacks up a mountain is "a gentle slope." Clow loves "long walks". It's a British thing: they've got miles and miles of rolling green countryside, and Brits imported the love for long walks to Turkey. In the '80s and '90s, British retirees began discovering the southern coast of Turkey and either went on extended vacations or permanently moved there in droves. This may shock you, but the weather in the U.K. does not typically inspire retirement vibes. So, tiny villages on the coast became huge tourist complexes, and the industry grew. Clow came to Turkey as this frenzy crested and sought to get away from all that. Desiring to recreate some of the long walks of her homeland, she started hiking and retreated to the mountain "yayla" (highland) villages, where the locals have been retreating in summer for centuries. Up 1,000 kilometers or so from the sea below, it's a bit cooler and a bit easier to hang out with a herd of goats and sleep through the hot parts of the year. While in those villages, she found a bunch of forgotten archaeological sites. The Lycians built scads of city-states on the coast of the Mediterranean and formed the Lycian League to compete with other naval powers at the time. They were conquered by Alexander the Great and got Hellenized, much like everywhere else in between Athens and India. 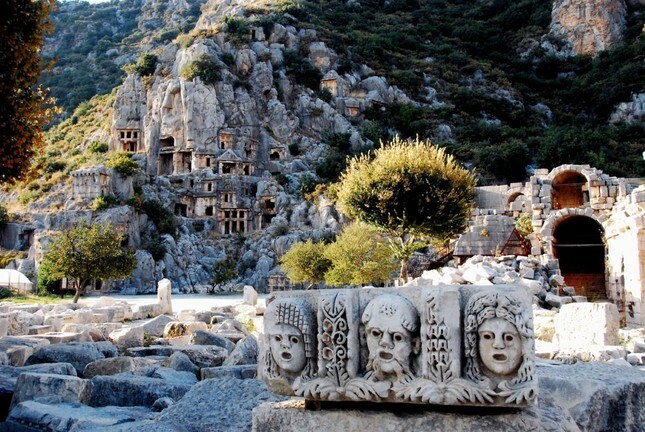 The Lycian Greeks governed themselves democratically, grew lots of olives, minted coins, and built a lot of tombs. They had a thing about death, it is clear even in major cities like Fethiye you can find thousand-year-old sarcophagi in the middle of traffic roundabouts. 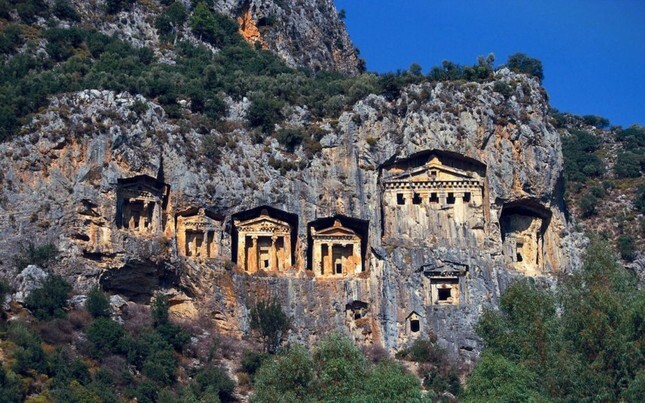 Fethiye, along with a few other places down south, has tombs carved into cliff walls, not unlike Jordan's Petra. After the Lycians, it was the Romans, and after the Romans, it was the Byzantines; thus following the pattern of history everywhere in this country. Lycia though had a distinct culture, and they left their imprint on the land. Hulking walls, tombs and crumbling castles dot the coast.Clow saw a golden opportunity. Alongside teams of local and foreign volunteers, she bushwhacked through goat paths and mule trails and solid scrubby thorny brush to create a trail through the ancient kingdom of Lycia. Her vision was to see the coast as the Lycians saw it, and as the shepherds of the mountain villages still see it - at walking speed. And so the Lycian Way was born - a 500ish kilometer-long trail from Fethiye to Antalya, weaving through rural coastal towns and ruins alike. She wrote a guidebook so detailed that she'll describe the width of the path, the kinds of landmarks you'll see and how long each stretch of trails should take, and yet still vague enough to get bafflingly lost and wonder how you could have misinterpreted her instructions to go left at the boulder in the clearing. Her army of volunteers waymarked the trail with, oddly, the Polish flag, two painted stripes of red and white. Every hundred meters or so on the trail you'll see it sprayed on a boulder. Losing the trail of waymarks is actually half the fun. You can do the trail with a grunge tank of money or a student's budget - either is possible. The trail weaves through a bunch of villages, as I've mentioned, and the locals have realized that nigh every day, exhausted backpackers come through and might need a bite to eat or a place to stay. To save money you can simply camp the whole time, but throwing in a nice rest day at a local motel adds a little color. You can hike it in any season, except summer, which is what I'm doing now. I have sweated in places that I did not know had sweat glands. My internal organs were sweating. During my day hikes, my body has been coating itself with a slick sheen, like some kind of horrible bipedal snail. A few years ago, my brother and I hiked a portion of the trail in January, and we were graced with gloriously sunny weather. We couldn't camp at all, but with a choice between that and my current predicament of losing 1/8th of my body weight in saltwater every 10 minutes, I would go with winter hiking. But it is truly beautiful here. I'm writing this from the village of Alinca, high above the resort-y valley town of Kabak, far away from the grotesque pulsing EDM on the beach and the TL 15 ($4.12) fast food. I've got a view of two massive limestone mountains, furred over with stubborn thyme and olive and pine, dropping dramatically down into the blue of the Mediterranean. The motel I'm staying at, Omer's Place, is one of about six houses total in the village, and everyone we've seen so far in this tiny settlement has waved us in for çay and encouraged us to rest our weary feet. Cicadas buzz and goats bleat. If I stay in the breezy shade I feel cool, and if I need to warm up I stand for about 30 seconds in the noonday sun and then retreat back under the cover of the grapevines. I do have a few recommendations for the trail, based on my two days of summer hiking experience. My first recommendation is have more money. 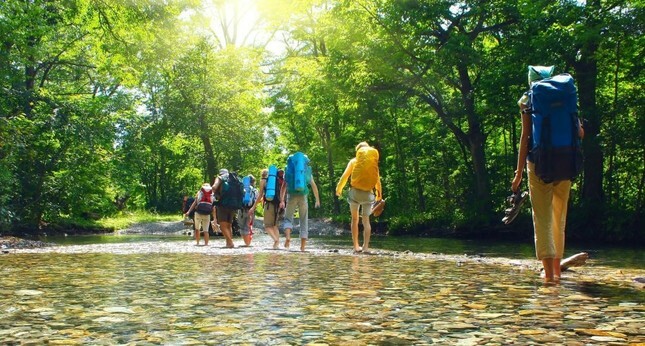 Barring that, you should do this hike with more than just yourself or more than a few people. A big group trek is always a lot of fun, but also, you can more easily spread around the gear. I'm hiking with my girlfriend Harriet and we have two huge packs carrying our tent, our bedrolls, our clothes, food and a day's worth of water. Though we packed pretty minimally, it still weighs an enormous amount. So maybe Clow is not lying about the times and distances maybe we're just egregiously out of shape. You know when you go down to the bakkal and buy 5 liters of water and have to haul it up the stairs? Get like three of them, then strap it to your back and haul it up the side of a mountain. It's enough to give everyone except I guess Clow severe neck cramps. But should you manage to encourage your dupes of friends to come along, you'll have extra pack mules to share the load. Yes, I am telling you to use your friends as pack mules. Tell them they get to see the ocean.Always make sure to avoid hiking in the heat of the day, adopt the Spanish custom of siesta and find a nice place to plop your bags on down and read for a few hours. If you've got a little side bag of olives and cheese, you can snack on them and even feel a bit sophisticated, despite the fact you're coated in a thin layer of grime and trail dust. Amuse yourselves with trail games like "what is trail mix called in your country?" For New Zealanders, trail mix is apparently called "scroggin", which was enough to send me into fits of giggling. The only Turkish word I know for anything even close to trail mix is "atıştırmalık," which means snacks, and because I have no Internet while hiking, I cannot look it up. Not being able to look things up is part of the fun of hiking. The trail is easily separated into bits and doesn't have to be done all at once. You could easily hop on a "dolmuş" (a shared-taxi like public transportation) in the middle of a particularly grueling part of trail which, I assure you, we will be doing in the next day or so and skip to a more exciting route with more ruins or at least more interesting scenery. 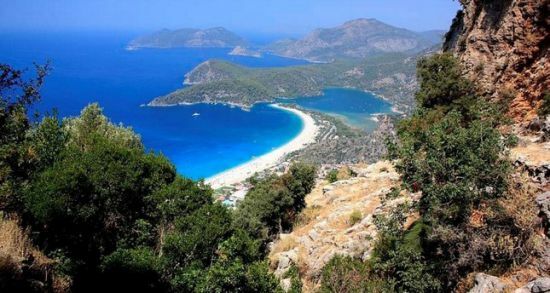 Then you can spend the rest of your time lazing about on the glorious beaches at Patara. You have to get Clow's guidebook to really know how to get around and where to go. Just remember to take her with a grain of salt and account for your own human frailty before attempting to summit even the gentlest of climbs. I didn't, and I am now spending an entire afternoon tapping out this article on a shady terrace. Ok, I guess it's not so bad after all. 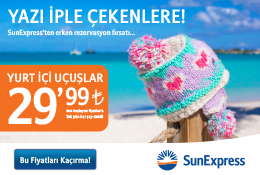 To get to the Lycian way, get a flight to Dalaman or Antalya and take a village bus to your preferred starting point. You can find Clow's "The Lycian Way" guidebook online or in most bookstores in Fethiye and Antalya.